I am a party animal. I'm not as wild as my mother-in-law, but I still like to party. And by party, I mean I drink non-alcoholic punch, skype with Britt, and apply an overly-bright shade of nail polish. But on my toes only, of course. I have to maintain some sense of decorum. I never really liked punch growing up. I don't like fruit punch or cherry flavors, so I always migrated elsewhere. But my mother...ooh, my dear, sweet mother...she made this for my bridal shower almost 2 years ago back in California, and it was good. The idea that you could combine a carbonated beverage and a type of ice cream brought me to my knees. Now readers, I am completely aware that this is no new concept. Some of you party animals have been making this for ages, I'm sure. But this is for that one person who doesn't know about this. I'm in the business of changing lives on this blog, and that doesn't stop now. Over-dramatic? Possibly. But it's worth it. This has a creamy texture with a little kick from the carbonation. Plus it costs about $3 to make and has enough in it for about 8-10 people. 2 liter of either a) Sprite, b) 7 Up, or c) Any fun flavor variation of the two. I used Diet Cherry 7Up. Why not? The beautiful thing about this is that it doesn't have to be raspberry. You could do orange, lime, etc. Just choose your favorite flavor! Pour the entire 2 liter into a punch bowl. Let your sherbet sit out on the counter for 10-15 minutes, just so it's not hard as a rock. Run your ice cream scooper under warm water before scooping. 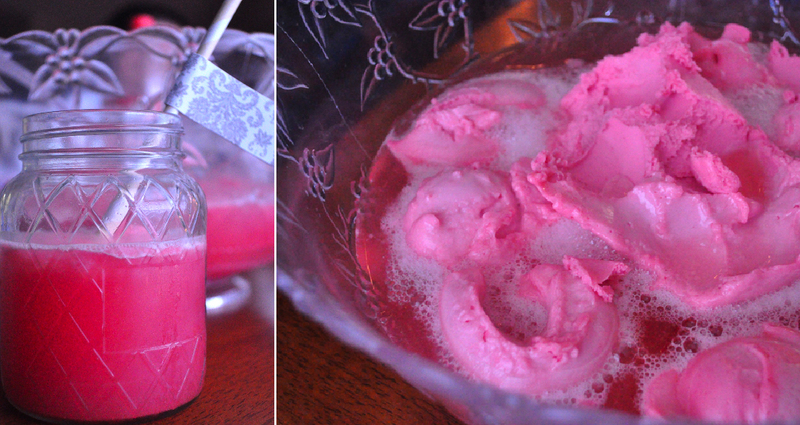 Place dollops of sorbet in the 7-Up. Once you've dumped it all in there, let it sit while the sorbet melts. It'll get a little sudsy. This is normal. Serve in some super-cute cups. Because a bright pink punch deserves something pretty to be served in. You can also throw in some cut up strawberries as a garnish, and coat the rims of your cups with sugar. You won't be sorry! How easy is that? And if I'm being honest, I use this quite often, especially when I'm having a few guests over. It's so simple, cheap, and fun! This is the perfect summer drink, whether you're hanging out by the lake, having a barbecue, or just relaxing with friends.